Brenlee and I began collaboration in the Spring of 2016, when she was funded by the Office of Scholarship, Creative Activities, and Research (OSCAR) to study environmental patterns in the whale fossil record. 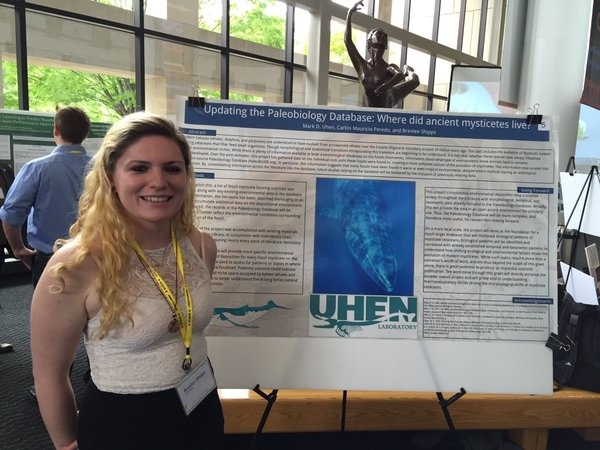 Brenlee presented her research at the GMU Undergraduate Research Symposium, winning the Dean's Award for Undergraduate Research in Earth Science (3rd Place). Brenlee currently serves as a Learning Assistant for Historical Geology labs (GEOL 102). Cristina visited the Smithsonian National Museum of Natural History as a two week intern to study fossil marine mammals. Cristina's primary project included collecting morphological data on mysticete mandibles. She also learned to make 3D models from CT scans and prepare fossils from matrix. Jaimie assisted with Historical Geology labs (GEOL 102) as a student teacher completing her Earth Science Lab Practicum. Jaimie worked closely with students and learned valuable science communication skills.